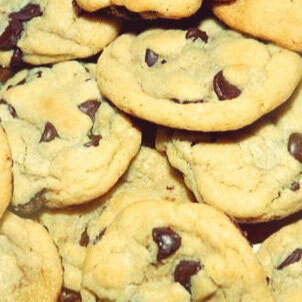 Anybody who tells you they don't make cookies because its a lot of work is...lying! Baking cookies is easy, however getting them right each time isn't always. But if you follow our CHEWY CHOCOLATE CHIP COOKIE recipe carefully, you'll get the same great results we do. I suspect the reason why most people don't make cookies is that theirs don't end up fluffy, crisp on the outside yet soft on the inside, like they should... they all run into each other, and make one big pile of dough that sticks to the sheet and you end up throwing out in a huff. There are many reasons for this. The first one is the ingredients. The flour has to be very fresh, the butter has to be nice and chilled, the sugar has to be non-refined (or replaced in half the quantity by brown sugar) or it will melt too quickly, the chocolate should not be too dark (no more than 50 to 60% cocoa content). You can also try no-phosphate baking powder if you can find it. The second is the preparation. The trick is to not over mix the ingredients. Cookie dough should be very stiff, barely holding together. If you over beat, you warm up the butter which will start to melt even before the dough goes in the oven, and the air that is trapped in the dough will seep out while cooking. You can keep any remaining dough in the refrigerator while you are cooking a batch. You can even keep it overnight, which makes it even stiffer. It can even be frozen, and cooked frozen (although you'll need a few extra minutes of cooking time). The third is the cooking. Cookies don't bake for too long - 15 to 20 minutes, on a pretty low heat (140°C ideally). Don't reuse a cookie sheet right after it has come out of the oven, it needs to cool off first.